KIEV, Ukraine -- Ukrainian President Petro Poroshenko promised to continue a military offensive against pro-Russian rebels after his forces retook key insurgent strongholds. A pro-Russian fighter stands guard at a checkpoint in the village of Karlivka near Donetsk, eastern Ukraine. Recovering Slavyansk and Kramatorsk in the battle-torn eastern part of the country is the biggest victory so far in Ukraine’s campaign against rebels. The pro-Russian insurgents are regrouping in Donetsk and preparing for an onslaught against the regional capital, Denis Pushilin, leader of the self-declared Donetsk People’s Republic, said on Twitter, adding that his forces abandoned two more villages overnight. As the insurgents lost ground, Russia urged a renewal of peace talks, with Foreign Minister Sergei Lavrov telling his German and French counterparts yesterday that a durable cease-fire is needed in the wake of the “sharp deterioration of the situation” and the rising toll on civilians and infrastructure. Poroshenko said he would tighten the circle around the militants in the east. “This is not the final victory, and no time for fireworks,” Poroshenko said in a statement on the president’s website. The rebels have retreated across large swaths of territory in the mainly Russian-speaking border regions. Ukrainian government authorities said July 4 that they controlled almost two-thirds of the country’s eastern districts. Clashes between the separatists and Ukrainian forces continued in the east. There was no word on when internationally sponsored peace talks may resume. Two drones were detected flying above the Donetsk region city of Mariupol overnight, with one aircraft shot down by Ukraine’s army, according to a statement by the press office for the military. An army grouping twice came under fire, with the attackers using mortars, it said. No casualties were reported on the Ukrainian side. The months-long conflict is coming to a head after Poroshenko sent troops to dislodge the rebels in the east. Poroshenko had predicted a new round of international peace talks as early as yesterday, though there was no further word on when that might take place. The hryvnia strengthened 0.7 percent against the dollar on July 4 in Kiev. The ruble weakened 0.5 percent to 34.44 per dollar by 6 p.m. in Moscow. Its 2 percent slide this week is the most on a closing basis among more than 100 global currencies tracked by Bloomberg. The rebels had to leave positions in Slavyansk “to save 45,000 civilians that are still located there,” as well as because of the superiority of government forces, Andrei Purgin, deputy premier of the Donetsk People’s Republic said by telephone. He said the militants may take part in peace talks with Ukraine’s authorities if Russia and the European Union initiate consultations and act as mediators. Ukraine’s State Border Service said on its website that about 15 rebels attacked a monitoring post near the Sea of Azov in the far southeast early yesterday, killing one border guard and wounding eight others. In a separate clash, one Ukrainian soldier was killed and four wounded in a fight near Karachun Mountain in the Slavyansk area, the military said on its Facebook page. 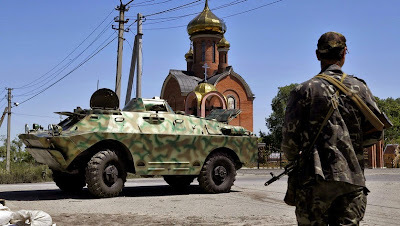 Seven Ukrainian soldiers were killed and six wounded in a fight with separatists near the village of Novoselivka-1 in the Donetsk region, the military said. National Security Council chief Andriy Parubiy said July 4 in Kiev that Ukrainian forces had recaptured 17 cities and villages since the military operation began, including four villages after a cease-fire ended on July 1, and controlled 23 of the 36 districts in the regions of Donetsk and Luhansk. As government forces dislodge rebels from a swath of territory in the Donetsk and Luhansk regions, Russia is sending weapons across the frontier and allowing militants to attack border checkpoints from its territory, Ukrainian security officials said. Russia rejects the “tired and unsubstantiated” accusations that it’s arming insurgents, according to the Foreign Ministry in Moscow. The Ukrainian president said a cease-fire is only possible after he gets confirmation it will be honored by separatists. Poroshenko has blamed the insurgents for breaking the 10-day truce more than 100 times. Russia denounced the intensified Ukrainian military campaign, with the Foreign Ministry pointing to the heavy civilian toll, power shortages and destroyed infrastructure as a result of the offensive. The reliance on the armed forces and preference for “ultimatums and ever new demands” by the authorities in Kiev contradict an agreement reached by the top diplomats from Ukraine, Russia, Germany and France, it said. French President Francois Hollande and German Chancellor Angela Merkel sought to step up diplomacy aimed at reinstating the cease-fire. In a phone conversation with Russian President Vladimir Putin on July 3, they raised pressure on him to push the militants to reach an agreement with Ukraine. “The situation is very tough,” Poroshenko said in the statement yesterday. Peace in Donbass necessary as soon as possible but, only in case of complete and unconditional disarmament of pro-Russian rebels.